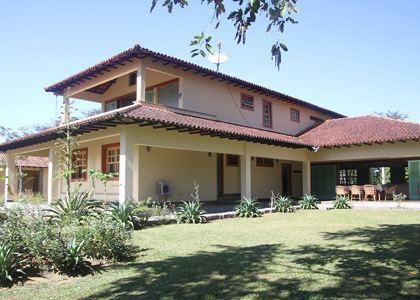 The lodge opened in 2004 to provide high quality accommodation for visitors to explore the Atlantic Forest here. The lodge is small, with ten rooms, a relaxed and informal atmosphere, and situated with a dramatic backdrop of the restored wetlands and the forested Serra dos Órgãos mountains, part of the larger Serra do Mar range in south-east Brazil. 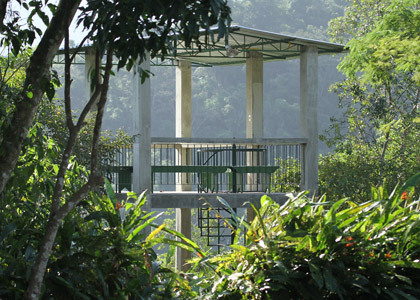 Guests have access to trails into both low and high altitude humid forest and the reserve wetlands. In addition REGUA runs excursions to a variety of other Atlantic Forest habitats for bird species not found at REGUA. The lodge is non-profit making, with all income generated going towards our conservation work. 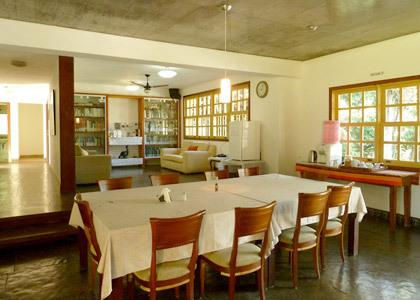 The lodge is equipped to a very high standard with air-conditioned rooms, a spacious and comfortable lounge, a large dining area, an excellent natural history library, a small swimming pool, 24 hour electricity with numerous power sockets (110 and 220 volt), solar heated hot water and free WiFi. All accommodation is full board with breakfast, lunch and dinner included. All of our meals are delicious local dishes, freshly prepared by our cooks using locally sourced ingredients, and we can cater for a variety of dietary needs (please advise us when booking). Hot meals are served for lunch (if you decide to stay out all day then we will provide you with a packed lunch) and dinner. Early breakfasts are also available for birders and naturalists wanting an early start. The lodge has a comprehensive natural history library with an impressive range of books and journals on birds and other natural history, focusing on South America. You can also pick up free self-guide trail leaflets, leaflets on butterflies, moths and other animals and buy a bird checklist. We offer a laundry service for a small fee. This service does not include undergarments and socks, however, laundry soap is available on request. Please note that clothes are line-dried so drying times are weather dependant. 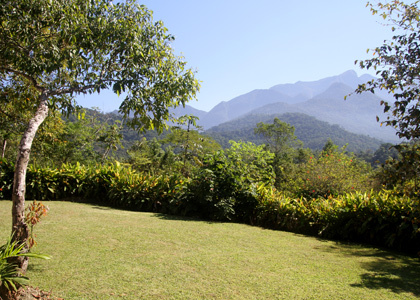 Our beautifully maintained gardens provide excellent birding and photography opportunities from the veranda and belvedere. Fruit feeders attract noisy groups of euphonias, chlorophonias and tanagers including Brazilian, Flame-crested, Golden-chevroned, Burnished-buff and Yellow-backed. On the hummingbird feeders Swallow-tailed Hummingbirds chase off Rufous-breasted Hermits, Reddish Hermits, White-chinned Sapphires, Black Jacobins, Violet-capped Woodnymphs and Glittering-throated Emeralds. Around the garden, the rare Black-legged Dacnis, Rusty-margined Guan, Swallow Tanager, Maroon-bellied Parakeet, Ferruginous Pygmy-Owl, Rufous-tailed Jacamar, Rufous-thighed Kite, Channel-billed Toucan, Blond-crested Woodpecker, Chestnut-backed Antshrike and Long-billed Wren are among the wide variety of birds often encountered. At night Tawny-browed Owl, Tropical Screech-Owl and Pauraque may be seen, and mammals including Paca, Nine-banded Armadillo and the occasional Crab-eating Fox also visit the garden when all is quiet. The two-tier viewing platform at the edge of the lodge garden is an excellent place to watch the sun setting over the restored wetlands and the magnificent forest-clad Serra dos Órgãos mountains, caipirinha in hand. In the mornings the belvedere is also a good spot to photograph birds in the tree canopy. In October 2013 we constructed the world’s first purpose-built ‘moth wall’ in the lodge garden – a roofed concrete wall with a mercury vapour bulb and a black fluorescent bulb on each side. The moth wall makes it easy for guests at the lodge to help us with our moth research – by photographing the moths and emailing to us photos of any species that are not shown on our checklist for us to identify and add to our image library. Please note that for the sake of the wildlife on the reserve no pets are allowed. All bookings must be made in advance. To make a booking or an enquiry please contact us.